Mid-January is when real estate agents say their phones start ringing off the hook. More homes for sale, more choices for buyers, and more competition will be the name of the game within the next few weeks. PHOENIX — Mid-January is when real estate agents say their phones start ringing off the hook. More homes for sale, more choices for buyers, and more competition will be the name of the game within the next few weeks. 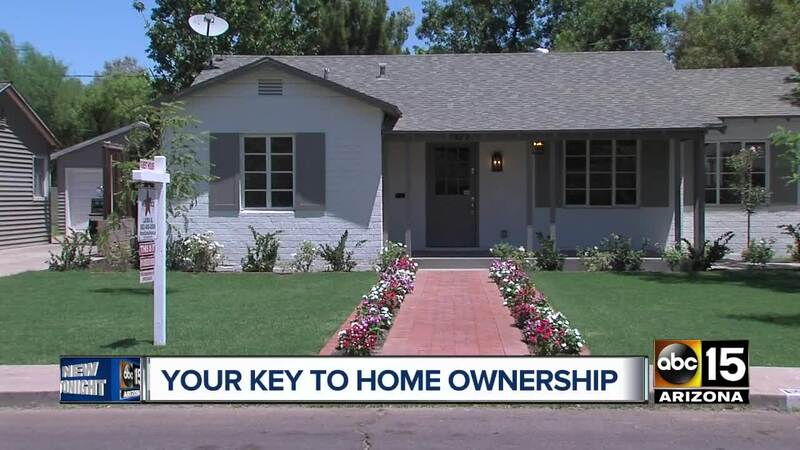 Unlike in New York City or San Francisco, owning your own home is an American dream that is very attainable in Arizona. No matter what your budget is, there is something in just about every price range, although depending on how long your "must have" list is, you may have to be willing to commute a little farther to get to work. For Sean and Hanna Horn from Gilbert, the dream of owning their own home was one they were skeptical of achieving at first. One works in the tech industry, the other at a call center. The couple admits they had many misconceptions about buying a home. "The biggest one we had was we had to put a 20 percent down payment down. Had to," said Matt Horn. The couple quickly learned a 3-5 percent down payment was enough to get their foot in the door. Real estate agents say you can even work with sellers to help pay the closing costs before sealing the deal. Now the Horn's are proud homeowners with every item on their checklist marked off. "We needed a big enough kitchen counter and a shower head that's taller than six feet," said Hanna Horn. Other items on their check list included three bedrooms, a loft, and a big backyard; all for a little less than $250,000. In Mesa, the home buying process was a little more challenging for Matt Esena. He admitted he had looked at more than 60 properties with his real estate agent Mara Benson, with Bliss Realty & Investments. He found that homes within his price range, which was under $300,000, were getting snapped up fast by buyers who had cash. "There are a lot of cash buyers in my price range, so they come in and pay cash on the spot," said Esena. In fact, just a few months ago, real estate agents said they were getting 15-16 offers on a home. "Now it has slowed down. Buyers can breathe, take their time, really look at the properties out there," said Benson. But she advised buyers that housing prices could go up by about 4 percent by the summer of 2019, so those looking to purchase a new home should keep that in mind. One of the best things you can start doing now, if you plan to buy a home soon, is take a look at your credit score. Real estate agents had many sad stories about excited families, losing out on their dream homes just because their credit score didn't live up to it's mark. Jeff Wood with the A. Tom Wood Team said he saw that a lot. "Unfortunately our school systems teach us how to do long division and algebra but they don't teach us about credit, or how to do taxes," said Wood. We asked him what would be considered a good score, in order to get approved for a home loan. "My lender advises me anyone over a 640 and makes adequate income should qualify," said Wood. It can take a few months to get your score back on track. Once you are ready to start looking, keep in mind you can get more bang for your buck, outside Phoenix city limits. Whether it's the east or the West Valley, if a family home with a big backyard is what you want there are plenty of them out there. "You will see more land, a bigger house, or even a newer house in say Mesa, Tempe, Chandler, or Queen Creek," said Benson. Unlike many other big cities, you don't have to be rich to own a home in Arizona. Just like Sean and Hanna Horn learned, this American dream is attainable if you're willing to do what it takes to qualify for a house. "It's not as expensive as you think, it is obtainable," said Horn. To get an idea of what type of home you could get in each part of the Valley, we looked at Zillow to see what's for sale within the $200,000 price range. We found more single family homes with backyards with multiple upgrades, on the outskirts of Phoenix such as San Tan Valley, Chandler, Mesa, Glendale, and Peoria. In downtown and central Phoenix within the $200,000 price range we found older homes that needed renovations and one bedroom apartments that were under 1000 square feet. Gilbert and Scottsdale had many townhomes available within that price range.